Exam Date: CSIR-UGC JRF(Junior Research Fellowship)& NET (Eligibility for Lectureship) :19th June, 2016. For Junior Research Fellowships (JRF):Maximum 28 years as on 01-01-2016 (upper age limit may be relaxed up to 5 years in case of candidates belonging to SC/ST/OBC, Physically handicapped/Visually handicapped and female applicants). 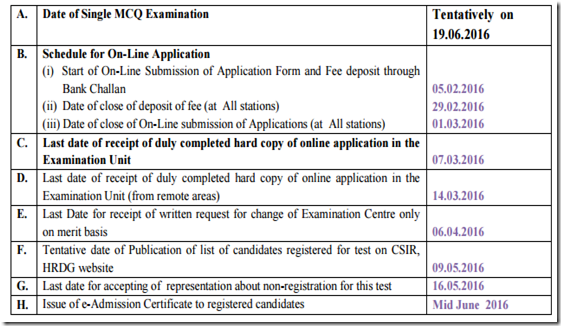 The final result of this Single MCQ test may be declared sometime in the month of March/April, 2016 and fellowship to successful candidates will be effective from 1 st January 2017 with the validity period of 2 years for joining the fellowship under CSIR Scheme.